Katie McCarthy hails from Annapolis, MD. 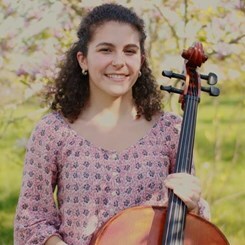 Based in the Washington, D.C.-Metropolitan area, she is pursuing her Bachelor of Music in Cello Performance at the University of Maryland under the tutelage of Dr. Eric Kutz. She has performed with the University of Maryland Symphony Orchestra for the past four years. She regularly performs with chamber groups at the University of Maryland and performs contemporary works and premiers with the student-run contemporary music ensemble, TEMPO. Ms. McCarthy has performed in various summer festival orchestras. At the Interlochen Summer Arts Festival, she played in the World Youth Symphony Orchestra and the Interlochen Philharmonic, where she held a principal position. She has also played in the Brevard Music Center Orchestra side-by-side with esteemed faculty members. She attended the National Symphony Orchestra Summer Music Institute at the Kennedy Center in Washington, D.C., giving performances on the Millennium Stage and in the Symphony Hall. Most recently, Ms. McCarthy played in the National Orchestral Institute Philharmonic in June of 2018, giving many performances, including a concert with all “conductor-less” orchestras. Her past teachers have included Daniel Shomper, Felix Wang of Vanderbilt University, and Rachel Young of the National Symphony Orchestra. She has played in masterclasses with prestigious musicians, such as the Shanghai Quartet, Andrew Shulman, and Hai-Ye Ni, the principal cellist of the Philadelphia Orchestra. Ms. McCarthy has taught young musicians from elementary school to high school age at a wide variety of musical starting points and abilities. Her teaching style is adaptable based on each student’s individual needs, but always emphasizes building a strong technical foundation while helping students discover their own joy and relationship with music and their instrument! In her free time, Ms. McCarthy hosts a classical music show at her local college radio station, goes museum-hopping in Washington, D.C., and likes running. Request Lessons with Katie McCarthy today!